Beyer Carpet Cleaning would like to take a moment and say thank you to all our American active soldiers and veterans. Beyer understands the sacrifices that are made each and every day not just from our soldiers but from their families as well. Choosing the road of a solider isn’t an easy decision to make when you’re life could be at risk and when you have to leave loved ones for months and years at a time. 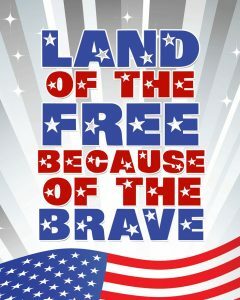 If it wasn’t for the soldiers who fought for the freedom of America Beyer Carpet Cleaning may not exist today. Our country could be a totally different place where it is difficult for the people to make their dreams come true. A country where it is difficult to support and provide for your family in the best way you se fit. If it wasn’t for the soldiers that have fought on the front lines of war we may not have the rights and freedoms we have today. Is our country perfect? Is our government perfect? No, America and the government are not perfect but we the people are allowed to change it and make it better for us. The most basic freedoms such as education, speech, and voting are rights that not everyone in the world have. 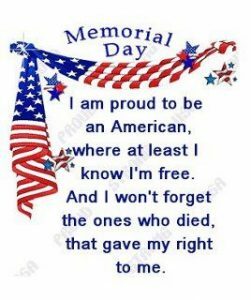 We the people need to embrace our most basic rights and be thankful to those who have fought for those rights on our behalf. We are living in a time where if your opinion is different from others or if you don’t agree with the “popular” end of issues you are viewed as wrong, hateful, or closed minded and are told to not speak. However, our soldiers fought for the rights of all Americans so that we all could be entitled to an equal opinion and the right to speak our mind on issues. If you begin to take away others rights to have an opposite opinion or view then we are slowly taking away from the meaning of the Land of the Free for which lives were lost to protect this right. We must not take away rights from others so that our personal ways or agendas rule over everyone else. We have the right to agree and disagree. We the right to do as we see fit for ourselves and our families. We do not have the right to take others rights aways simply because it is not the same. 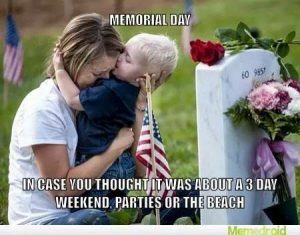 So today as we enjoy our 3 day weekend take a moment to remember why American men and women have laid down their lives and how blessed we are to have the freedoms that we have today. We must come to a time where it is okay to be different from your neighbors. A time where if you vote for the other guy it isn’t blasted on Facebook or discussed over the dinner table. A time where you aren’t condemned and disrespected for voting for the other guy or having a difference of opinion. A time where we respect each other for their differences. A time where we all truly have equality and really do share the same rights. Beyer Carpet Cleaning would like to personally thank PaPa, Cousins Ezekiel and Elihu, Pastor Brandon, Brother Daniel, Brother Moses, friends Marc, Alfred, and Ben and all those who have served and are serving. Thank you, thank you, thank you!